It&apos;s that time of year again! The weather is warm, the skies are clear and that&apos;s the perfect excuse to grab your picnic blanket and head to Republic Square Park for Movies in the Park. Movies in the Park is a free, monthly film series brought to you by the Austin Parks Foundation, and presented by the Alamo Drafthouse. 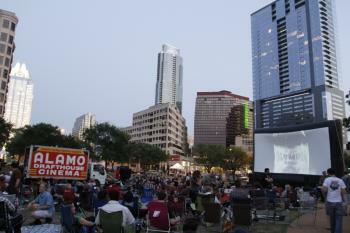 Each year, APF and the Drafthouse bring you free movies in the heart of downtown Austin at Republic Square Park. Visitors and residents can bring their blanket or lawn chairs (and even a picnic dinner!) for a fun and relaxing evening under the beautiful night sky surrounded by the lights of downtown. Dogs, kids, picnics, and lawn chairs are welcome. Getting there: To help with traffic and to keep things green, consider hopping on a bike to get to Republic Square. There is bicycle parking on the east side of the park (don&apos;t forget your lock! ), and be sure to bring lights since it will be dark by the time you head home. Another convenient option is to hail one of many Austin pedicabs. If you prefer public transportation, check out the CapMetro website.